Have you ever watched a logging railroad show? Steam locomotives, wooden trestles, twisting trackage and steep grades, combine for fascinating railroading. Many lines were narrow gauge. Incline and decline cable operations. Sawmill visits and loggers at work, in the vast forest. Toppled steam engines, derailments and washed out trestles, were all part of the area history. Ocean loading of old schooners are in this one. Caternary/ Tuolumne have a fine series of logging line feature films. This program has comprehensive coverage of 50 years of Northern California logging. The coastal redwoods are an awesome tree, as seen in these films. They can grow to unbelievable huge sizes. Early films offer views of loggers at work, using handtools. Some films date back to 1904! Later on, a 1936 sequence shows the new Caterpillars and heavy trucks being utilized. Circa 1906 shows the interior of a busy sawmill. Without enough lighting, to illuminate the scenes, a creative solution was found. All they had to do, was to remove the roof. There are a wide variety of logging operations: Caspar, Union, Holmes-Eureka, Northern Redwood and Simpson Redwood. Also, Hammond, Dolbeer and Carson. Additionally, Pacific Lumber Companies and their respective railroads. More action on the Arcata and Mad River. Last but not least, Northwestern Pacific Railroads. The early 1900’s are in clean black & white film. Still photos are referenced to illustrate the story. After the early era, it is nearly an all color, 16mm film show. By 1938, crisp color footage is the dominant source of film. The films are digitally enhanced. Overall, they look splendid! This collection of vintage films are beyond rare. There is way too much within this show to list everything in a review. The program is very well organized. The main menu plays the show from the beginning. A sharp script, effectively tells the tale of logging history. Assorted maps illustrate the multitude of routes by the logging lines. A narrative has the bulk of the information. Onscreen graphics offer even more info. A mixture of period piano and bluegrass styles are interspersed throughout. Dubbed sounds for the trains and various audio elements are excellent. A handful of old-timers have commentaries at relevant points in the program. Ted Wurm and Henry Sorenson are notable author/ historians with detailed back-story. We have the PBS style of presentation in this show. It is very effective, and the wide ranging subjects are expertly arranged, into an understandable history lesson. 2-6-6-2 Mallets, 2-6-2 types, are a couple of steam classes viewed. Some diminutive steamers as well. California Western plus Arcada & Mad River operate some saddle tankers. Shays on The Mad River! Heislers are seen. Intriguing shots and in full color. Contemporary update of Henry Sorenson’s 0-4-0T engine. His restoration and loco background are told. 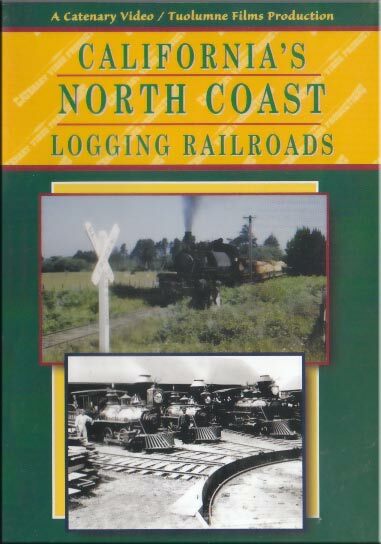 California’s North Coast Logging Railroads, is a definitive, and very enjoyable program. At times, it veers far off from the railroads themselves. Then it returns to the logging trains. A near complete examination, on a plethora of related logging operations. If you seek greater ‘in depth’ coverage of more train oriented logging lines, the Catenary videos, have several excellent releases. However, if you just want to see a 50 year general overview of California logging, and the railroads, this one aims to please. This entry was posted in ATVR Reviews, Catenary Video and tagged American Train Video Reviews, California, Logging, new releases, PBS style, Railroad, steam train by William J. Hudson. Bookmark the permalink.